I used to think the Kohler Karbon faucet reminded me of an 80s Italian car manufacturer but this image reminds me of storks at the waterhole. I really wanted to find out why I would need dual Karbons in the kitchen, after all it articulates so surely it will reach to every corner of the sink, no? Unfortunately as usual with Kohler when you click on the photo it takes you to an article that DOESN"T MENTION THE FAUCET AT ALL. Does Kohler know how infuriating this is? If you're gonna make me look you'd better be sure I'm satisfied with what I see. Anyway, it looks as though one is for washing up or maybe rinsing vegetables and the other is for... soaking the chips 'n' dip??? 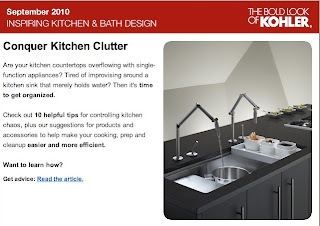 Please guys at Kohler, link the images to the relevant articles in the future and put me out of my misery by telling me what to do with the second Karbon faucet. that's the giant 44" sink - the karbon doesn't stretch that far. On the 33" sink, a single Karbon works fine.